Continental Resources (CLR) has reached an agreement to pay $649 million for almost 120,000 acres, primarily in Williams and Divide counties, from Samson Resources. The deal expands Continental's dominant Bakken position to more than 1.1 million acres! The deal includes 6,500 boe/d of production (82% oil) and was announced in conjunction with the sale of assets in the company's Eastern Region. The sale included 1,100 boe/d of production and raised $125 million. 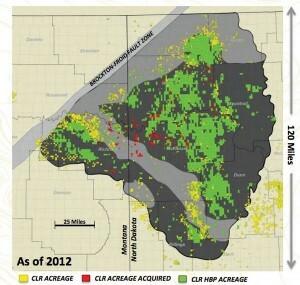 The Bakken acquisition includes over 45,000 net acres where Samson and Continental were already partners. CLR's interest in the assets increased to 71% from 46%. Almost 35,000 net acres are already held by production from existing wells. Continental has a lower working interest (34%) in the rest of the acreage acquired, but will operate the bulk of the wells in the area. Of the remaining ~74,000 acres, almost 30,o00 is held by production from existing wells. It is becoming more apparent that Continental believes economy of scale is going to add value to their bottom line. Bigger operators have more negotiating power in everything in the supply chain all the way to the midstream and downstream markets. Plans to expand ECO-Pad drilling across the basin also adds motive to consolidate fragmented interest across the basin. If invested all the capital, research and technical expertise in drilling multiple wells on location at one time, you'd want to benefit from operational success as much as possible. There's no sense in doing the dirty work for passive partners when they are willing sellers. "This is a classic bolt-on acquisition, from a number of perspectives - strategic, tactical and financial," said Rick Bott, President and Chief Operating Officer. "It fits nicely into our deeper bench Three Forks de-risking plan, and we expect it to add immediate value. Within the next 30 days we plan to spud the first of 10 wells in the northern region, targeting the deeper benches to confirm commercial production and appraise our down-spacing concept, so we can quickly leverage operational efficiencies with pad drilling."